We’ve started clearing out the overgrown weeds and invasive trees all over our property. And when I say we, I mean my father-in-law Tim is being completely generous and doing most of the leg-work. He’s a permaculture and landscaping expert. I lucked out I guess! So far we’ve shaped the flower bushes, laid down organic compost in the garden beds, killed the encroaching perimeter of weeds on our 1 acre property and cut down about half of the “trash trees” aka trees with no aesthetic or edible purpose. There’s still a ton to do. Including ripping out a broken down hen-coop that’s been out-of-use for five years. Prepping and planting a 12-foot-long bed of strawberries. Ripping out some sad grape and kiwi plants. Installing a fire pit / chill space in the front yard. And clearing out weed ridden space in our backyard for future use as a “faerie garden.” (Oh man I have so many dreams for that space! Trellised confederate jasmine! Rose spheres! A reading nook!). All that said, the space has tons going for it already. There’s a thicket of blueberry bushes, a Japanese persimmon tree, a pomegranate tree (which isn’t doing too hot in this humid VA weather), a bed of asparagus, a mulberry bush and rows and rows of perennial flowers. All we have to do is pull out the things we don’t like and fill in the empty spaces with stuff we love. Oh wait, did I tell you guys we’re trying to buy the house we’re renting currently? Right. So there’s that. Along with that has come, of course, stress. And on top of that we’re trying to start Logan’s coffee and chocolate business on the right foot. It’s been a long time in the making. And I guess you could say Logans a bit of a perfectionist when it comes to passion-projects. So we’re waiting until we’re confidant that everything is lining up and our products are THE BEST THING EVER. Amidst all of the simultaneous turmoil and joy, I’ve been recipe testing like a boss! I’ve got lots of lovely recipes coming your way. But first, this ice cream cake! 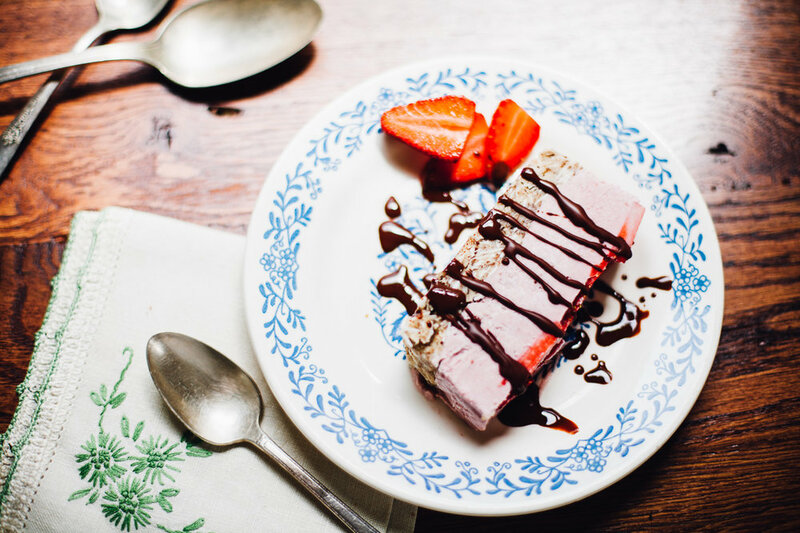 This raw vegan strawberry banana ice cream cake is creamy, cool and rich. It packs a classic “strawberry-banana” punch that, oddly, reminds me of full-fat strawb-nana flavored yogurt cups. But, you know, way better. The crust is simple: almond meal, coconut flakes, maple syrup and coconut oil with a dash of vanilla and a pinch of salt. It’s a nutty complement to the bright berry flavor of the ice cream. 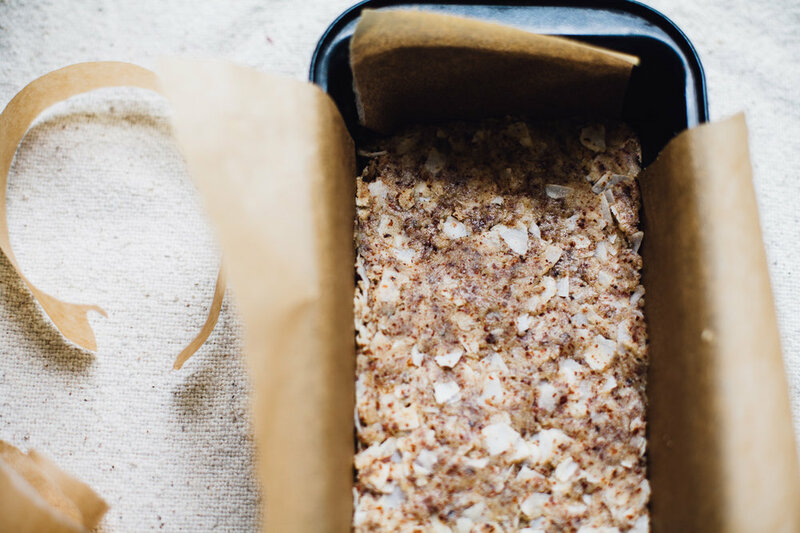 It’s a lot like raw coconut cake, dense and nourishing. 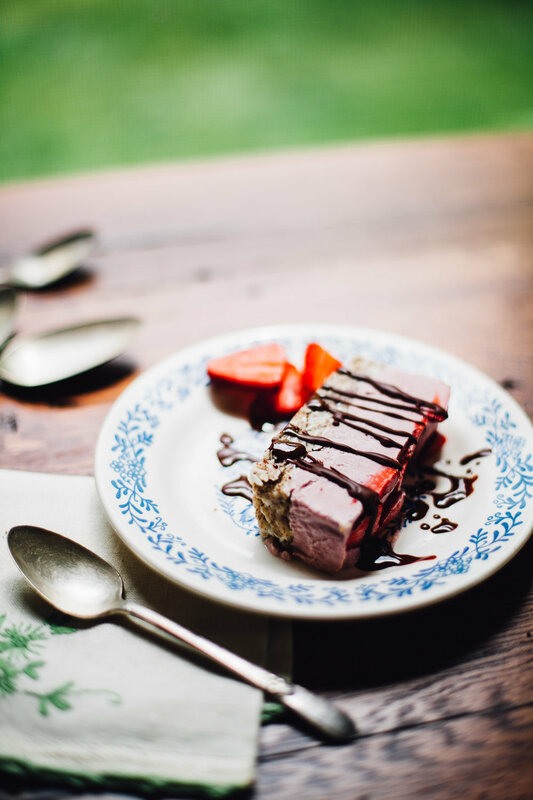 I made this raw vegan strawberry banana ice cream cake on a warm day and drizzled some of our chocolate overtop. Needless to say, it was dreamy. I can imagine serving this to friends on a cool Summer evening, the heat of the day waning. Sinking into it surrounded by people I love. Sitting outside around a fire with a drink in one hand. Enjoying the distant sound of grasshoppers needling their tunes. All while watching fireflies winking in symphony. This ice cream slice cake is as simple as it gets! 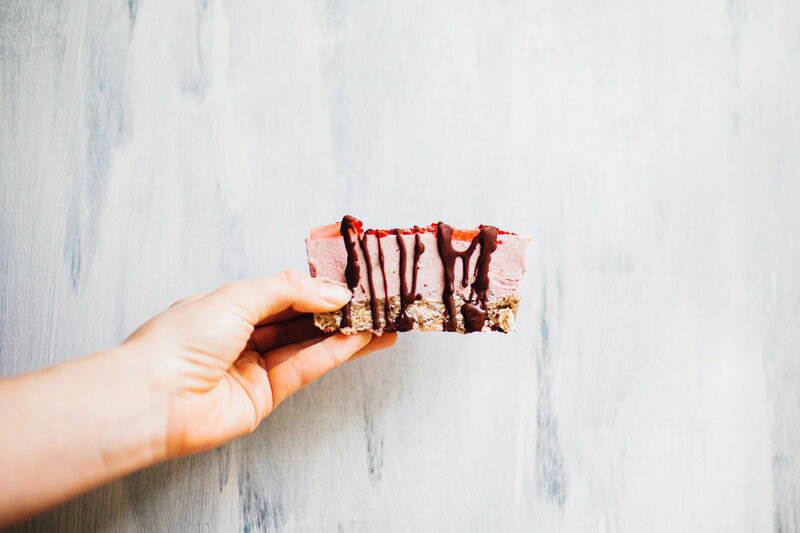 1 part nana ice cream + 1 part raw almond coconut “cake.” It’s all very quick — but it at least 6 hours of freezing time, so factor that in to your prep time. 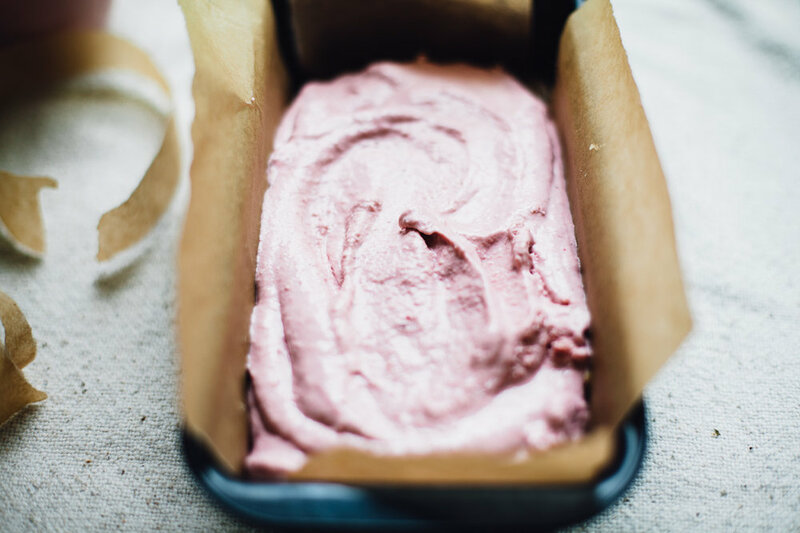 Line a loaf pan or small brownie pan with parchment paper. Set aside. In a medium mixing bowl, stir together the almond meal, coconut flakes and sea salt. Add the coconut oil, maple syrup, vanilla (if using vanilla bean, split + scrape out the seeds and discard the pod). Stir everything together for a minute or so, until the mix looks like wet sand and can be pinched together between your fingers. Press the raw cake base firmly into the bottom of your pan and smooth out the top. Drain your soaked cashews and discard the soak-water. To the bowl of a high powered blender, add the cashews, frozen strawberries, frozen banana, lemon juice, vanilla (if using vanilla bean, split and scrape out the seeds and discard the pod) and 1 tablespoon water. Blend, scrape down the sides of your blender and add more water as you need (up to 1/4 cup) to grease the wheels of your blender and get everything smooth and creamy. Scrape the thick ice cream base into the pan over top of the cake base, spreading out the top smoothly. 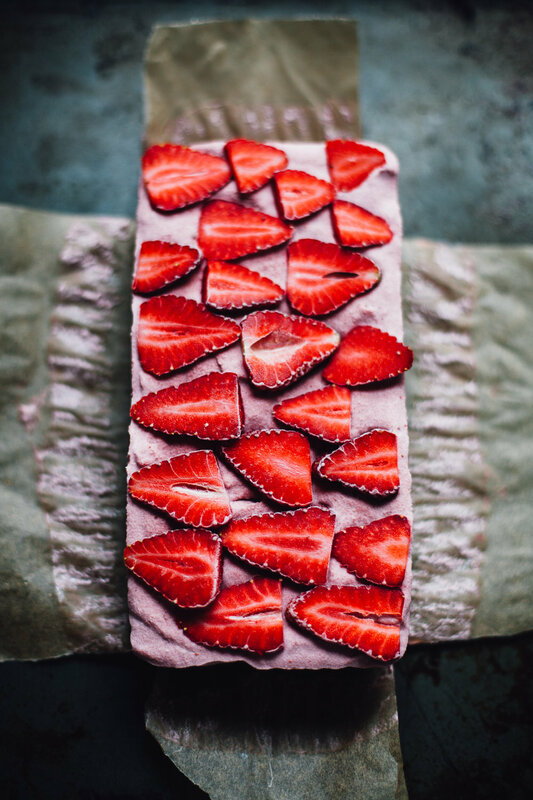 Arrange your thinly sliced strawberries overtop in a pattern that appeals to you. Freeze for 6 hours, up to overnight. To serve, let thaw at room temp for 10 minutes before slicing + drizzling chocolate lightly overtop. While it\'s still cold it can be eaten with your hands, but if you prefer it softer serve it plated with more strawberries and eat with a sharp-edged spoon. Enjoy!